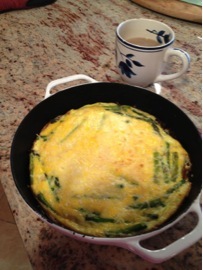 My cousin Paula makes the best omelet I’ve ever had using only asparagus and eggs. As simple as it is, when I tried to recreate it, something seemed to be missing. This year, when spring rolled around and asparagus came into season, I felt inspired to try again. 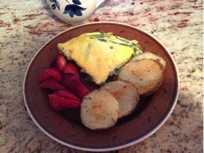 I decided to jazz up this great combination with a little Parmesan cheese, and then bake it in the oven as a frittata. While it may not be as good as Paula’s, it still hits the spot. It’s best served warm with home fries, fruit salad and coffee. And the dish is not just for breakfast; it would also work wonderfully for an easy and nutritious dinner. In a small bowl, whisk together eggs and ¼ cup milk. Set aside. Heat butter over medium heat in oven-safe pan. Add asparagus pieces and cook approximately 5 minutes, or until asparagus is tender. Pour egg mixture over asparagus. Add half of your shredded cheese. Once eggs are almost set (after about 5-6 minutes), sprinkle the remaining cheese on top. Put pan in oven and bake for about 15 minutes, or until the frittata is firm and the cheese has melted. Cut into 4 wedges and serve. Lisa D’Agrosa is a second year Nutrition Communication student. Asparagus is actually one of her least favorite vegetables when it isn’t cooked up with eggs. She also can’t stand watermelon.